On July 6, 2011, a comet was caught doing something never seen before: dying a scorching death as it flew too close to the Sun. That the comet met its fate this way was no surprise -- but the chance to watch it first-hand amazed even the most seasoned comet-watchers. "Comets are usually too dim to be seen in the glare of the Sun's light," says Dean Pesnell at NASA's Goddard Space Flight Center in Greenbelt, Md., who is the project scientist for NASA's Solar Dynamics Observatory (SDO), which snapped images of the comet. "We've been telling people we'd never see one in SDO data." But an ultrabright comet, from a group known as the Kreutz comets, overturned all preconceived notions. The comet can clearly be viewed moving in over the right side of the Sun, disappearing 20 minutes later as it evaporates in the searing heat. The movie is more than just a novelty. As detailed in a paper in Science magazine appearing January 20, 2012, watching the comet's death provides a new way to estimate the comet's size and mass. The comet turns out to be somewhere between 150 and 300 feet long and to have about as much mass as an aircraft carrier. "Of course, it's doing something very different than what aircraft carriers do," says Karel Schrijver, a solar scientist at Lockheed Martin in Palo Alto, Calif., who is the first author on the Science paper and is the principal investigator of the Atmospheric Imaging Assembly instrument on SDO, which recorded the movie. "It was moving along at almost 400 miles per second through the intense heat of the Sun -- and was literally being evaporated away." Typically, comet-watchers see the Kreutz-group comets only through images taken by a coronagraph, a specialized telescope that views the Sun's fainter out atmosphere, or corona, by blocking the direct blinding sunlight with a solid occulting disk. On average a new member of the Kreutz family is discovered every three days, with some of the larger members being observed for some 48 hours or more before disappearing behind the occulting disk, never to be seen again. Such "Sun-grazer" comets obviously destruct when they get close to the Sun, but the event had never been witnessed. The journey to categorizing this comet began on July 6, 2011, after Schrijver spotted a bright comet in a coronagraphic image produced by the Solar and Heliospheric Observatory (SOHO). He looked for it in the SDO images and much to his surprise he found it. Soon a movie of the comet circulated to comet and solar scientists, eventually making a huge splash on the Internet as well. Karl Battams, a scientist with the Naval Research Laboratory in Washington, DC, who has extensively observed comets with SOHO and is also an author on the paper, was skeptical when he first received the movie. "But as soon as I watched it, there was zero doubt," he says. "I am so used to seeing comets simply disappearing in the SOHO images. It was breathtaking to see one truly evaporating in the corona like that." After the excitement, the scientists got down to work. Humans have been watching and recording comets for thousands of years, but finding their dimensions has typically required a direct visit from a probe flying nearby. This movie offered the first chance to measure such things from afar. The very fact that the comet evaporated in a certain amount of time over a certain amount of space means one can work backward to determine how big it must have been before hitting the Sun's atmosphere. The Science paper describes the comet and its last moments as follows: It was traveling some 400 miles per second and made it to within 62,000 miles of the Sun's surface before evaporating. Before its final death throes, in the last 20 minutes of its existence when it was visible to SDO, the comet was some 100 million pounds, had broken up into a dozen or so large chunks with sizes between 30 to 150 feet, embedded in a "coma" -- that is the fuzzy cloud surrounding the comet -- of approximately 800 miles across, and followed by a glowing tail of about 10,000 miles in length. It is actually the coma and tail of the comet being seen in the video, not the comet's core. And close examination shows that the light in the tail pulses, getting dimmer and brighter over time. The team speculates that the pulsing variations are caused by successive breakups of each of the individual chunks that made up the comet material as it fell apart in the Sun's intense heat. "I think this is one of the most interesting things we can see here," says Lockheed's Schrijver. "The comet's tail gets brighter by as much as four times every minute or two. The comet seems first to put a lot of material into that tail, then less, and then the pattern repeats." Figuring out the exact details of why this happens is but one of the mysteries remaining about this comet movie. High on the list is to answer the not-so-simple question of why we can see the comet at all. Certainly, there are a few basic characteristics of this situation that help. For one, this comet was big enough to survive long enough to be seen, and its orbit took it right across the face of the Sun. It was also, says Battams, probably one of the top 15 brightest comets seen by SOHO, which has observed over 2,100 Sun-grazing comets to date. The SDO cameras, in of themselves, also contributed a great deal: despite being far away and relatively small compared to the Sun, the comet showed up clearly on SDO's high definition imager. This imager, called the Atmospheric Imaging Assembly (AIA) takes a picture every 12 seconds so the movement of the comet across the face of the Sun could be continuously watched. Most other similar instruments capture images every few minutes, which makes it hard to track the movement of an object that's only visible for 20 minutes. But ultimately, the fact that one can see this comet against the background of the Sun means there is some physical process not yet understood. "Normally," says Goddard's Pesnell, "a comet passing in front of the Sun absorbs the light from the Sun. We would have expected a black spot against the Sun, not a bright one. And there's not enough stuff in the corona to make it glow, the way a meteor does when it goes into Earth's atmosphere. So one of the really big questions is why do we see it at all?" Figuring out this question should offer information not only about material in the comet, but also about the Sun's atmosphere -- and so this opens up the door to a new niche of study. Assuming, of course, that one can spot some more comets. So far SDO has only seen the one passing in front of the Sun, though SDO did spot Comet Lovejoy traveling through the corona, as it went behind the Sun and reappeared. 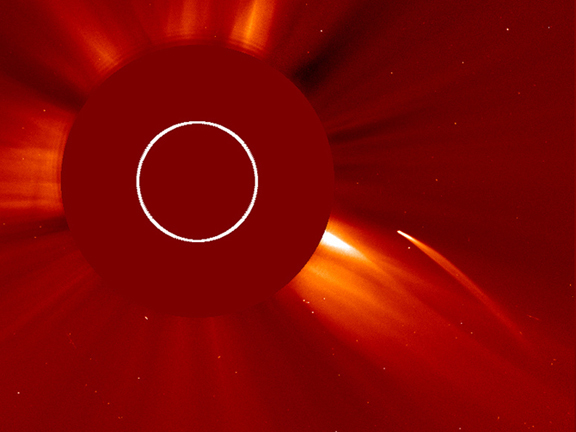 Stay tuned, as new Sun-grazing comets appear every few days . . .